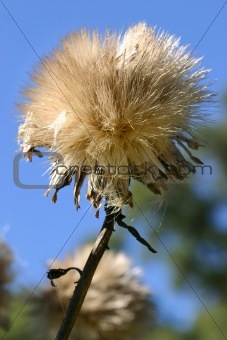 Image Description: The large mature seed head of Cynara cardunculus L contains a mass of parachute seeds, (similar to dandelion) each with a crown of hairs that become airborne with the slightest gust of wind. Stalks are edible. Grows 2m high. Colours range from whitish to purple/blue. Photographed at Mt Tomah Botanic Garden.